A teacher at the Gymnasium Paulinum, a priest, convinced Pieper to read the works of Thomas Aquinas. "At that time," Pieper wrote, "I was foolishly fond of Kierkegaard, whom we used to devour, my friends and I, naturally without quite understanding him; and it was this paternal friend and teacher, who directed me  with a sort of violent, ironical, and humorous intensity  to St. Thomas' Commentary to the Prologue of St. John's Gospel. Being a youngster of eighteen, I set about reading this work and, in fact, finished it, of course, again without understanding it perfectly. But from that moment the work of St. Thomas has accompanied me through life." Years later he translated this Commentary to the Prologue of St. John's Gospel into German. Pieper went to the University of Münster in 1923, and later on he went to Berlin. The plan of his first book  which he ultimately submitted to the university in order to obtain his doctorate in philosophy  was born during a lecture on Goethe and Thomas Aquinas, given by Msgr. Romano Guardini at the Jugendburg Rothenfels on the Main in 1924; the lecture was entitled "About Classical Spirit." Pieper's first book, Die Wirklichkeit und das Gute (Reality and the Good; contained in Living the Truth [Ignatius Press, 1989]) based on St. Thomas' works, tries to show that the good is nothing else but what is in accordance with the reality of things. Pieper deviated from this path of "pure philosophy" for some time; social problems fascinated him so much that he applied himself to the study of law and sociology. He became an assistant at the Institute of Social Research at the University of Münster. When, in 1931 the papal encyclical Quadragesimo Anno was published, Pieper wrote a few booklets explaining the fundamental idea of the " Entproletarisierung." Pieper said he would have devoted himself entirely to the social sciences if National Socialism had not come into power. From 1934 on, it became impossible for a Christian author to speak in public about the problems of social life. Fortunately, Pieper returned to his work in philosophy, attempting to build up from the elements of Western tradition  as it has been formed especially by St. Thomas Aquinas  a philosophical and ethical doctrine of man, which might be comprehensible to modern people. In 1934 he wrote a small book about the virtue of fortitude, Vom Sinn der Tapferkeit. "At first," wrote Pieper, "the manuscript was refused by all editors (later on, this fact proved to be a good example for explaining to my children, what a boomerang is) till at last one editor, Jacob Hegner (Leipzig), who made known in Germany the works of Claudel, Yeats, and Bernanos, accepted the book and at the same time asked me to treat in the same way all seven virtues." Pieper next wrote about hope. The small book was published in 1935, being just in time for the day of his wedding. During the years preceding World War II, two other works were published: one about the first cardinal virtue, prudence (Traktatrüber die Klugheit) and the other about the fourth cardinal virtue, temperance (Zucht und Mass). "To write about justice was quite impossible then in Germany," explained Pieper, "yet, in any case, I had put aside this treatise until later, for it seems to me just as difficult as that about love and up to now I have not yet written it." During the first year of World War II, he brought out only a little biography of his hero, St. Thomas Aquinas, titled Guide to Thomas Aquinas. Pieper joined the army and during the time he was in service a volume of the Summa Theologica or the Quaestiones Disputatae always accompanied him, and in the course of these years he succeeded in putting together two breviary-like collections of short sentences, chosen from the whole work of the Angelic Doctor, but they were not published until the end of World War II. One of these "breviaries," the more philosophical one, was published both in England and the United States under the title, The Human Wisdom of St. Thomas. His other scientific work, which he also finished during World War II, dealt with the idea of "veritas rerum" and its history. This work was of special use to Pieper after the war in procuring a professorship at the university, which, under the Nazi regime, had been impossible for him. 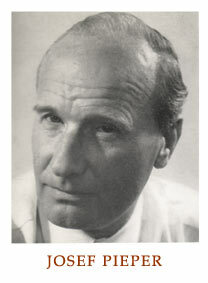 In 1946, Pieper became lecturer of philosophy at the Pedagogical Institute of Essen (Ruhr), at the University of Münster, and later on professor. The result of the experiences with afterwar university-life and of those first years of instruction found expression in two small books. The first one, Musse und Kult, develops two theses: first, that culture is founded on leisure, secondly, that leisure has its roots within the region of cult. The second book, Was heist philosophieren? draws the consequences of these theses for the study of philosophy. The primer for Christians, containing short essays on Catholic dogma and ethics as well as on the history of the Church, written in collaboration with Heinz G. Raskop, appeared in August 1951 under the title What Catholics Believe, with an introduction by Reverend Gerald B. Phelan, and in November of the same year, Leisure: The Basis of Culture, with a preface by T. S. Eliot. This is considered by many to be Piepers greatest work. Another classic is Faith Hope Love, a collection of Piepers famous treatises on the three theological virtues. Each of these treatises was originally published as a separate work over a period of thirty-seven years, and have been brought together in English for the first time in the Ignatius Press edition. The first of the three written, On Hope, was produced in 1934 in response to the general feeling of despair of those times. His "philosophical treatise" on Faith was derived from a series of lectures Pieper gave in the late 1950s and early 1960s. His most difficult work, one that he struggled with for years and nearly abandoned was On Love. Pieper felt that it is the most important book he has written. In it, he discusses not only the theological virtue of caritas-agape, but also of eros, sexuality, and even "love" of music and wine. "St. Thomas is still my hero," wrote Pieper in the early 1950s. "I think his work is inexhaustible and his affirmative way of looking at the reality of the whole creation seems to me a necessary correction modern Christianity cannot do without. Yet my admiration of Plato is likewise growing continually. And one theme not expressly treated by St. Thomas and the whole scholastic school is becoming more important to me than ever: the philosophy of history." Piepers interest in this topic would eventually result in the publication of Über das Ende der Zeit (The End of Time: A Meditation on the Philosophy of History) and Hoffnung und Geschichte (Hope and History). He also wrote some books engaging the thought of Plato, including Abuse of Language, Abuse of Power and Divine Madness: Plato's Case Against Secular Humanism. Pieper emphasizes the close connection between moral and intellectual virtue. Our minds do notcontrary to many views currently popularcreate truth. Rather, they must be conformed to the truth of things given in creation. And such conformity is possible only as the moral virtues become deeply embedded in our character, a slow and halting process. We have, he writes on one occasion, "lost the awareness of the close bond that links the knowing of truth to the condition of purity." That is, in order to know the truth we must become persons of a certain sort. The full transformation of character that we need will, in fact, finally require the virtues of faith, hope, and love. And this transformation will not necessarilyperhaps not oftenbe experienced by us as easy or painless. Hence the transformation of self that we mustby Gods graceundergo "perhaps resembles passing through something akin to dying."